I love this quote – it relates exactly to my top financial hack – front loading your life. I’m a big believer that you need to do as much as you possibly can as early as you possibly can. It’s so much better to load up on savings and investments in your 20s versus your 30s. But if you’re in your 30s already, it’s much better to start now than in your 50s or 60s. 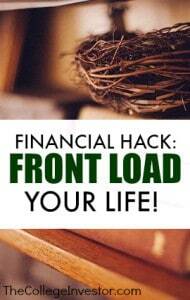 That’s why I wanted to share some strategies and reasons for front loading your life. Yes, it may be a small sacrifice up front, but it will pay dividends for years to come. Front loading is simple: stash as much money away as early as possible. It’s so much easier to max out your 401k when you’re younger, before you have large expenses, kids, and other things that add up. It’s also easier when you’re younger to make the small sacrifices you need to make more money and save more money. But if you don’t know where to start, here are some simple (and not so simple) suggestions. There are a couple of ways that you can really front load your life for success – but it does involve some sacrifice. Here are some strategies that you should consider to front load your life. Even if you’re already in your 30s or 40s, you can use these as food for though for reducing expenses. One of the biggest ways that you can front load your life is to live at home while in college or after graduation. Since housing is typically your biggest expense, cutting back or eliminating that and, in turn, saving that money, can put you on the fast track to financial success. Just living at home puts $24,000 more in your savings account in just 4 years! If you do nothing else, and invest that money at age 25 in the stock market, it will be worth $521,000 at age 65. If you only have $4,800, it will only be worth $104,000 at age 65. That’s the power of compound interest! Another key to front loading your life is to prolong large purchases as long as possible. By this, I mean don’t buy that expensive car right out of college – keep driving the beater car you had in high school until it dies. If you really need a car, stick to an old used car that is inexpensive. Or better yet, avoid buying a car at all if possible – it’s a strategy that Mr. Money Mustache is all about. But there are other large purchases that tend to plague recent grads as well: clothes, computers, watches, vacations. All of these things can wait. Imagine if you combined your savings with housing with the savings you could achieve by avoiding large purchases – think of how rich you will be! Beyond saving and avoiding large purchases, you should also maximize investing accounts as much as you can. Try to max out your 401k at work, and make sure that you contribute the max to your IRA each year. While you’re young is also the best time to start a side hustle, and leverage that extra income to boost your savings. It can be much, much harder to maintain a money-making side hustle once you have a family! Leverage your youth! The goal isn’t to be frugal forever. In fact, the goal should be to front load as quickly as possible so that you can be less and less frugal as life goes on. The few early choices you have can make a huge difference later in life. If you can save and do a few smart things early on, you can live the life you want forever. What other tips and tactics do you have to front load your life? Are you a believer in this strategy? I’m a huge front loader guy myself, but I don’t even think I can comprehend the benefits in the future quite yet – I just know they’re going to be AWESOME. I wish there was some way to just see your “future self” for a hot second while doing this to even more motivate us to keep going 🙂 As a kid/teen/person in your 20s the last thing on your mind is saving for the future! Which is why I like reading all those early retirement blogs… they get to see the future all mapped out because they track everything and forecast. I love it. I’m glad to hear it J. Money! It would be nice to go back and give yourself a high five in 20 years! The wife and I are definitely believers in the power of compound interest. We did not save much in our 20’s but we are in our early 30’s now and really seeing that these next few years are critical to front loading. Nice, like the quote says – now is the best time to start! didn’t go wild in our 20’s we certainly didn’t do ourselves a lot of favours. help to keep us motivated! I love this concept. It’s what I live by, but putting words to it helps keep it in the FRONT of my mind. Great post. Ha – great point keeping things at the FRONT of mind! I am a front loader. Just wish I had loaded EVEN MORE up front. At least I’m in my thirties and not later…still early enough for me to save up big time and make it pay off through compounding. Compounding is a great reason to front load – and it doesn’t matter what age you start at – the earlier the better! You didn’t even mention the biggest reason of all to front-load your savings: it’s a lot easier to change your habits and start spending MORE money than it is to spend LESS. I’m now in my 40s. We did a great job of front-loading our savings in our 20s and 30s and so were able to move into our dream house when I was 41. The house is awesome and we can afford it thanks to our savings. But if we didn’t have those savings, it would be *extremely* difficult to go back to living frugal, for many reasons. That’s such a great tip! You’re totally right about being easier to spend more than less! The thing that made the biggest difference to me was sharing with two grad students in my early twenties, even though I was earning a good wage. So we did lots of cheap/free things together, allowing me to invest a third of my income. How are you supposed to front load a bunch when you have to pay off a large chunk of student loan payments each month? I am a very firm believer in front loading, but I would rather dump a lot into paying off my loans and be done with that in 5 years than to save it all. I am in my early 20s and I live frugally like what is described in this article, however, I am having a hard time figuring this thing out. I like to describe it the “AND” mentality, not the “OR” mentality. It’s not about paying your student loans OR saving. You can pay down your student loans AND save. Keep working to be done with your loans in 5 years – that’s an awesome goal. However, is there any place you can boost your savings? Maybe your employer offers a 401k and you could up your contribution 5% this year? Maybe you can find a way to commit an extra $50 per month to save or invest? These small amounts go a long way later in life.